the cup is clearly carved in its imitation. from whence it inspired one's verses in the past. Written by the Emperor in the new Spring Month of the cyclical year dingyou (1777) of the Qianlong period." No other jade vessel of this shape is recorded, and it is remarkable to find a jade piece that imitates the classic form of the rhinoceros horn libation cups which were made in great numbers during the 17th century. A piece made of such calibre would most likely have been carved in the Imperial workshops in Beijing, where the ateliers were in part set up to experiment and develop skills in order to produce things that would please the patron, the emperor. The Qianlong emperor's love of novelty and the exotic influenced the items made during his reign, and the present jade piece, while extremely rare, is characteristic of 18th-century experimentation of creating objects to tease the eye, by using an unexpected medium of production. While copies of libation cups are known in blanc-de-chine porcelain and in bamboo, this appears to be the only one yet recorded in jade. Jan Chapman illustrates a boxwood libation cup carved in imitation of rhinoceros horn, which is nearly identical to the jade cup in many respects, as seen in its shape, size and composition of figures in landscape; cf. op. cit., p. 259, fig. 375 (see fig. 1). It is highly probable that both the jade and the boxwood cups were carved to copy an extant 17th-century rhino horn cup in the Palace Collection. Although the rhino horn cup model is currently not known, there is an example in the National Palace Museum, Taiwan, which bears a close resemblance to the jade cup; cf. Chapman, op. cit., fig. 354. Chapman, upon comparing the jade cup with rhinoceros horn examples notes that (p. 257), "The shape of the jade cup clearly indicates that the rhinoceros horn original from which it was copied was made from an African horn. Doubtless the African horn was used in preference to the Asian horn because of its flatter surface on which this type of decoration can be carved. At the time of the Qianlong Emperor (1736-95) it seems to have been the fashion to carve very detailed scenes containing numerous small figures in an expansive landscape where the trees are individually treated so as to distinguish one type from another." Images of scholars in pavilions beside rivers is a popular one found on numerous paintings and works of art including jade, as it is set in an idealised landscape that would have been conducive to scholarly thought and literary pursuits. The scene on the present cup is a depiction of Shangfang Mountain located in Suzhou where the beautiful scenery inspired the Emperor to write poetry in its praise. Woodblock prints dated to the 35th Year of Qianlong (1770) depicting Qianlong's grand tours, Nanxun Chengdian, 'Ceremonies of the Grand Inspections', under the section of Ming Sheng, 'Renowned Scenes', the scenic sites surrounding Shangfang Mountain was described in detail. 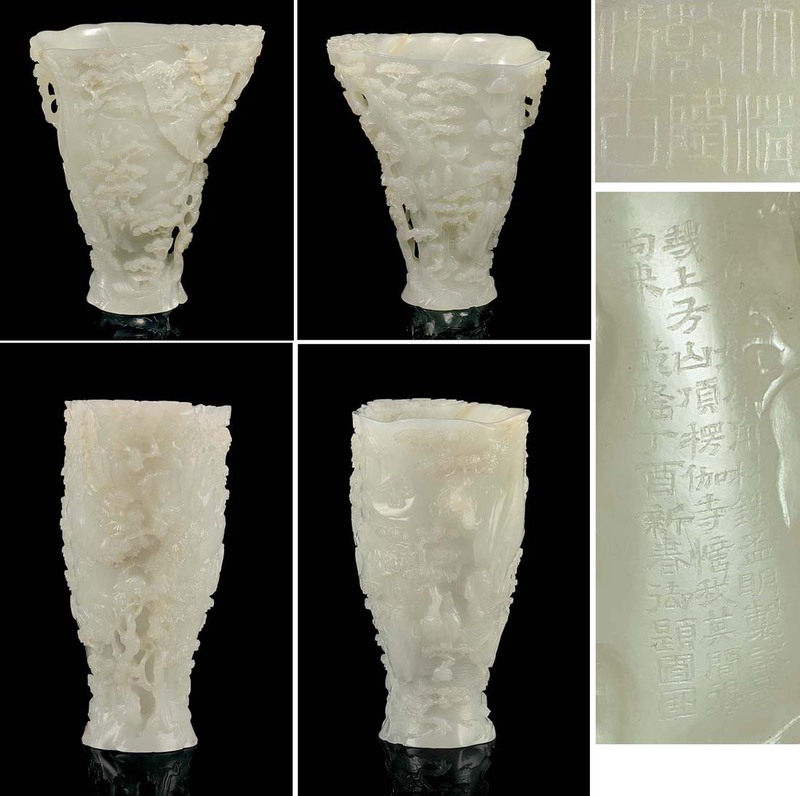 The composition executed on this jade libation cup bears many similarities to those found on jade boulders and plaques carved in the 18th century; see for example, Jadeware (III), The Complete Collection of Treasures of the Palace Museum, Hong Kong, 1995, pls. 72, 73, 77 and 78, for boulders with comparable landscapes, the first and last inscribed with Imperial poems describing the scene.